Address 118 S. Thompson St. 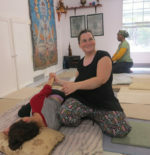 Basic Practice Description: Maureen facilitates opening the body and the mind as a Certified SomaVeda® Thai Yoga Advanced Therapist and Thai Yoga Teacher, Certified Yoga Instructor, Reiki Master, and Licensed Massage Therapist in the state of Missouri (no. 2014019204). Basic Practice Description: Bethany Bundy: SomaVeda Integrated Traditional Therapies® Currently enrolled in the Teacher Certification Program.